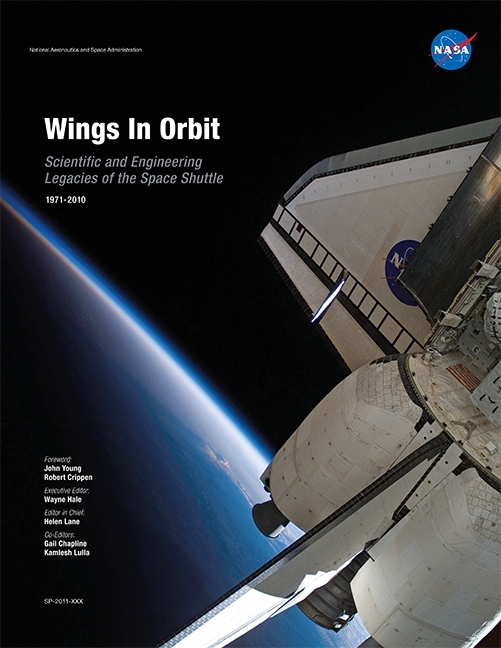 A few weeks ago, I blogged about Wings in Orbit: Scientific and Engineering Legacies of the Space Shuttle, 1971-2010, a new book published by NASA to mark the ending of the U.S. Space Shuttle Program. Wings in Orbit authoritatively documents the many accomplishments of the Space Shuttle program from its origins to the present. Beginning with a Foreword by astronauts John Young and Robert Crippen, this compelling book provides clear, accurate, and authentic accounts from NASA’s best subject matter experts, including aerospace engineers who worked with the shuttle program, and leading experts from the science and academic communities. The book captures the passion of those who devoted their energies to the program’s success for more than three decades. It focuses on their science and engineering accomplishments, the rich history of the program, and the shuttle as an icon in U.S. history. In a first for Government Book Talk, we’ve interviewed some key players in the development of Wings in Orbit. It’s an honor to welcome Robert Crippen, the pilot of the Space Shuttle Columbia’s first orbital flight into space, Dr. Helen Lane, Editor-in Chief of Wings in Orbit, Wayne Hale, Executive Editor, and Dr. Kamlesh Lulla, Co-Editor, for the first of a two-part discussion about this outstsanding new NASA book. GovBookTalk: Given the immensity of the Space Shuttle program, it must have been challenging to select the topics for Wings in Orbit, and the authors to write about them. How did you go about that? Bob Crippen: The intent was to try and capture the legacy of the Shuttle program, the good and the bad. That helped focus the type of subjects to include. We wanted to provide data that would help designers of future space craft. Also it was important to capture the educational aspects of the program because that is a fundamental objective of NASA to stimulate young people to become interested in science and math. Helen Lane: It was very difficult to determine the material to include, and that took over a year. We used the definition — must be an accomplishment that is used in other space programs or on Earth. Second, we wanted a book of less than 700 pages so we knew we could not cover it all. With the help of an extraordinary editorial board and interviews from leaders in the Space Shuttle program, we worked with all the NASA centers to finalize the work to be discussed. Once we knew the topics, we went to the engineers and scientists that did the work including those that were retired or worked in academia or industry. The contributors were volunteers. They worked on the book because of their dedication to the Space Shuttle and the desire to let the public understand this program within the context of the accomplishments. Once we got started, as you can see from the number of authors, we got great participation. Kamlesh Lulla: The focus of this book is scientific and engineering accomplishments from the Space Shuttle program. This clarity of focus helped us organize the contents. Wayne Hale: Selecting topics was not hard; eliminating topics and holding writers to a specific page count, that was hard. Once we outlined the book — about 1/3 on the Shuttle system and how it operates, about 1/3 on the scientific achievements of the shuttle and its payloads, and 1/3 on all the rest, history, society, etc., the community poured out with suggested topics and articles. It was an overwhelming flood. Our editors and their staff had to work day and night to reign in the various authors. The engineers, scientists, and managers associated with the space shuttle over thirty years were yearning to tell the story from their perspective. Unfortunately we were not writing a set of encyclopedia volumes and were limited to just one book. So it was a constant tugging match over what got in and what was left out. I wish somebody would publish the Encyclopedia of the Shuttle because there is enough material out there. Unfortunately, the magnificent team that was in place during the years of development of the Wings in Orbit book have largely dispersed and getting the people back together to write that encyclopedia would be nearly impossible. GovBookTalk: The Space Shuttle has a place in our culture as well as in science and technology. For example, I was surprised to find out that both Rush and Judy Collins have written songs about the Shuttle. Did you run across some things along those lines that surprised you? Helen Lane: We at NASA are probably more aware of the cultural aspects as we have movie companies, TV companies, artists, and musicians that regularly visit along with most sports teams. Our problem was what to include in this book. Kamlesh Lulla: I was surprised at the depth of influence Space Shuttle has on our cultural landscape: schools have been named after shuttle astronauts, Girl/Boy Scout local logos have used shuttle; the list goes on and on. Wayne Hale: The poets, songwriters, movie script writers, and other interpreters of the shuttle really did surprise us. I am constantly amazed at the outpouring of creative artistic work that surrounds a technological achievement like the Shuttle. As engineers, we are trained to be “tight-lipped and technical” or as a former administrator once said “I’ll have feelings when I’m dead”. The impact to society has been anything but tight lipped. Spaceflight inspires the romantics and the dreamers; always has and always will. GovBookTalk: One of the most interesting aspects of the book is the number of scientific and technical discoveries made as spin offs from the Shuttle program. Could you tell us about some of those? Bob Crippen: I believe the book captures a large number of spin offs, an important element of the program. This provides the public some more concrete results of the program. Helen Lane: There are hundreds of spin offs. NASA defines spin offs as technologies that can be patented and then licensed to commercial companies. There is a Web site that provides the some details: http://www.sti.nasa.gov/tto/shuttle.htm We chose examples to cover the gamut from health care to industrial applications. This web site also highlights some of the sciences, such as the discussion on pages 421-429 on the bioreactor. GovBookTalk: Were there questions as to how to handle the story of the Shuttle accidents? Bob Crippen: The two terrible accidents were an important part of the program. We wanted to tell the story accurately to minimize the probability of future accidents. Helen Lane: Yes, there was a lot of discussion on how to handle the accidents. The author, Randy Stone, was a flight director during both accidents. He tells the story as honestly as he could, but at the same time tried to transmit the emotions of the workers at the agency. It was felt very hard, and he tried to give the reader a feel for that. We wanted to have enough technical details for the reader, but not overwhelm them. The crews’ story was discussed with the goal of a very dignified accounting of their deaths. Wayne Hale: From the outset we promised ourselves that we would tell the truth and examine the bad as well as the good. Randy Stone did a magnificent job of covering those complex events in a chapter that I wish could have been much longer. We always learn more from our mistakes and failures than from our successes. The genius of American creativity is that failure does not stop us but spurs us on to achieve even greater things. GovBookTalk: The authors obviously interviewed quite a few people. Did they have any particularly memorable conversations with former astronauts or other well-known figures in the space program? Helen Lane: Yes, we had the opportunity to interview the original engineers and leaders that built the Space Shuttle, including Bill Lucas (former director of from Marshall Space Flight Center, Bob Thompson (first program manager), Chris Kraft ( founder of Mission Control as well as major leader), Aaron Cohen (former director of Johnson Space Center and directly involved with the orbiter, esp. the thermal protection system), and R.J Thompson, major manager of building the Shuttle main engines. I was thrilled to be able to talk with them and hear their insights. They provided much of the wisdom and direction for the topics to include in the book. Much of their experiences are recorded on the NASA oral history, available online. Kamlesh Lulla: These interviews enriched the contents of the book. Their insights were very valuable in compiling the contents. Look for Part 2 of the interview later this week!